Last week, FinDecor’s team of building painters participated to a group health and safety course for operating cherry-picker lifts, elevating platforms (also called scissor lifts) and forklifts. This course is intended for all those who think about renting a lift, be it for a painting job or any other renovating task located high up. 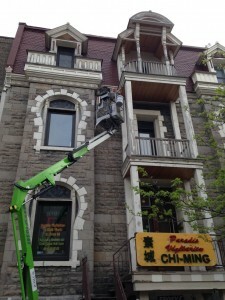 Indeed, it’s a lot safer to replace the ladder with an elevating platform when painting cornices and dormers. Elevation equipment rental companies do not always verify if their clients have the necessary training to operate safely their vehicles. Yet it’s important! An RBQ license (to learn more about the RBQ, read our post What is RBQ? Wear a clean and well-adjusted safety harness. And did you know you could be fined if you don’t respect some conditions? Wearing a safety harness (and sometimes a white helmet too) is mandatory: if a worker doesn’t wear one, he might have to pay a $1500.00 fine. The fine for working in construction without a CCQ card is of $1500.00 per worker and $5000.00 for each painting company. Our next painting at heights project will start in a few days. It’s a big cornice painting worksite located in Notre-Dame-de-Grâce (NDG), a Montreal neighborhood. We have to put a special care in making sure our work methods are safe because not only will we have to work at 40 feet high, we will also paint near electrical wires. 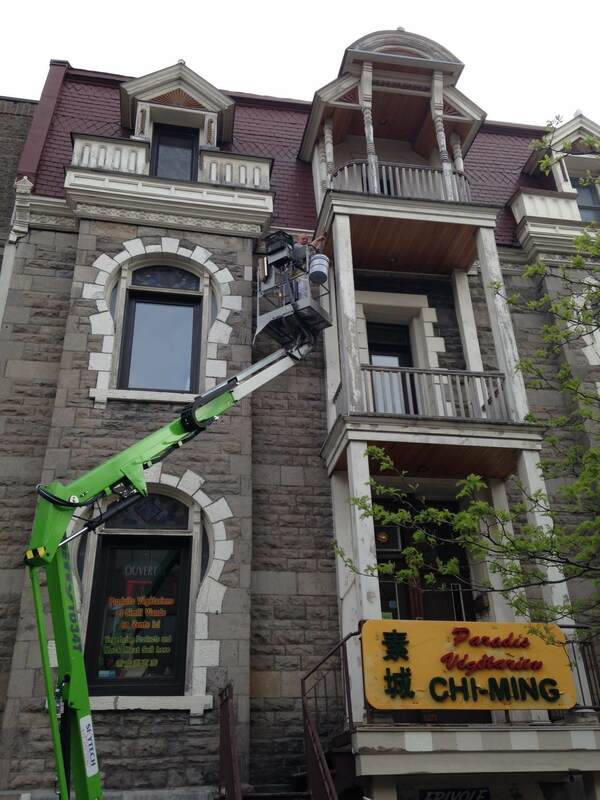 We phoned Hydro-Québec to make sure it was safe for our painters and for those who will be close to the building. We would like to thank Daniel Bouthillier, instructor at SEKUR ELEVATION, for having us. His class was very instructive, and we do recommend him to all those who wish to work at height. You can join him at 514 647-3035 to take his class. Who have a painting project that requires the use of elevation equipment and the expertise of certified painters? Contact us to make a reservation.